Rosa Gaujard belongs to the types of roses known as Hybrid Tea roses. These rose types are considered by many enthusiasts to be the Queen of all roses. Hybrid Tea Rose types offer a large range of colors and scent ranging from moderate to very strong. They do not bloom as frequently as floribunda or shrub roses and can be less tolerant of wet conditions. 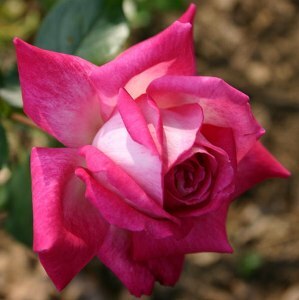 This beautiful rose is one of the most famous and well loved Hybrid Tea rose types. It is not quite as popular amongst show growers and traditionalists as they do not like what they consider its garish colors. It has little fragrance and its blooms do tend to split. For most people these are minor disadvantages when compared to its advantages. 1. Rose Gaujard is very vigorous, very hardy, very long lasting. 2. Grows well in poor conditions and will tolerate a lot of rain. 3. Blooms very freely with plenty of large and healthy leaves. These blooms will bear up to 30 petals light red in the inside and silvery reverse. 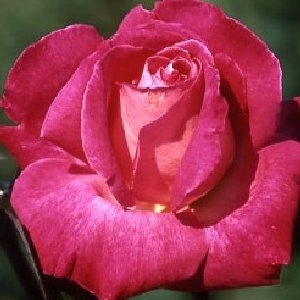 This rose types good disease resistance, plentiful blooms and leaves make rose gaujard an excellent choice for bedding. 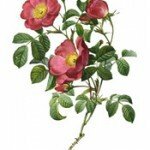 New Dawn Rose, Rambling/Climbing Types of Roses. The New Dawn rose belongs to the types of roses known as rambling roses. Rambling roses have been around since Victorian times and are ideal for pergolas, fences, arches, walls etc. They have long flexible stems that carry massive trusses of small flowers. Usually they will only flower once and can be prone to mildew. Blooms are carried on new growth so removing old or dead wood is vital to maintaining its health and beauty. Rambling roses are not as good for covering walls as their relative, climbing roses. However, they are spectacular as weeping standards, rambling through trees or as ground cover. 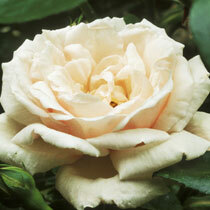 The New Dawn rose is a sport of once very popular rose called Dr. W. van Fleet. It is an excellent multi-purpose rose. Its blooms are semi-double, shell pink and fragrant. Although the blooms are small they are plentiful and appear throughout summer above glossy medium green leaves. Introduced in 1930 the New Dawn can be grown as a climber, a hedge or as a specimen shrub. Want to know how to plant roses in a bed, grow rose hedges and how to plant roses in borders. The method for pruning roses has been greatly simplified over the years this article explains both the traditional and new methods for how to prune rose bushes. Growing roses from cuttings is far simpler than it sounds and this article explains how to do it. This method of growing roses is a little more advanced but still very simple.As time passes on you might be interested in how to grow roses from seed. Whether for space reasons or for variety rose growing in containers is fun and beautiful. You could also consider rose growing indoors.